Computer Pentium-class PC or equivalent. Please access your course using a desktop or laptop PC. Internet browsers Please use latest versions of Chrome browser to run this course. 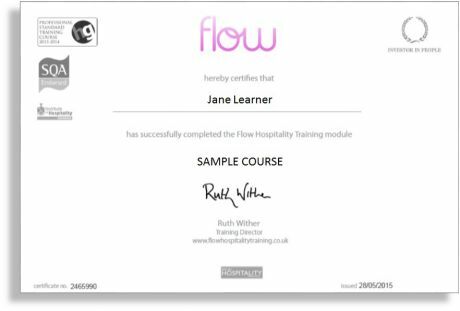 FLOW System Checker Click on http://checker.flow-ms.co.uk/ to run a series of checks that confirm your PC, laptop or tablet has the minimum system requirements needed to run FLOW training modules. 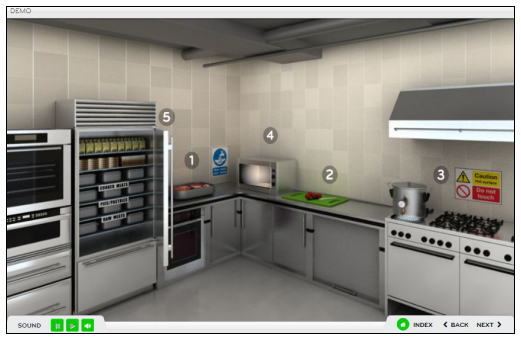 All staff that deal with food on a daily basis are required by law to complete food safety training before they start any work which involves handling food including drinks and ice. This course covers the training requirements for 'front of house' staff including kitchen porters, waiting staff, bartenders and room service attendants. It is appropriate for people who work in an area where food is prepared (but don't handle it themselves). Please see our Level 2 courses if you handle food directly. This course has been endorsed to by the Institute of Hospitality [IOH], the Scottish Qualifications Authority [SQA] and Quality Marked by the Hospitality Guild. The certificate can be downloaded from within the course once the learning has been completed. A learndirect completion certificate will also be sent by email. *This training is at "Level 2" standard. It is not a regulated qualification.